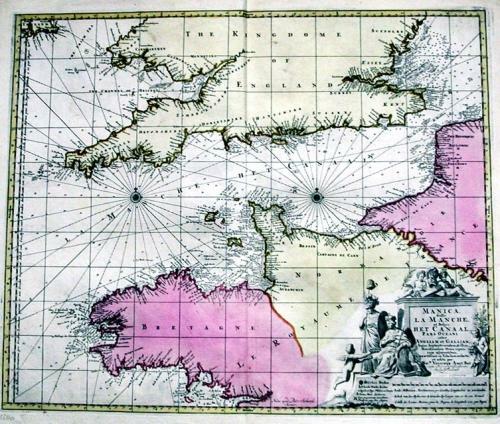 Title: 'Manica Gallis La Manche...' A copy of Visscher's chart that was engraved by Peter Schenk jnr. A detailed chart of the Straights of Dover/Pas de Calais and the English Channel/Chanel La Manche showing all the major and minor ports along the south coast of England (extending to southern Wales and Ireland) and those along the coasts of Picardie, Normandy and Brittany. Schenk marked the sites of a number of naval battles that took place in the vicinity: 1666 - East of Thanet Island,1690 - South of Beachy Point,1692 - South of Portsmouth. Two elaborate compass roses with radiating rhumb lines fill the sea area. The title cartouche shows a seated Brittania receiving a laurel wreath. The condition is very good apart from the worm holes in the lower left & right corners.